Today feels like a good day because I get to show you the cover of my new book! I also get to tell you a little more about what's inside. 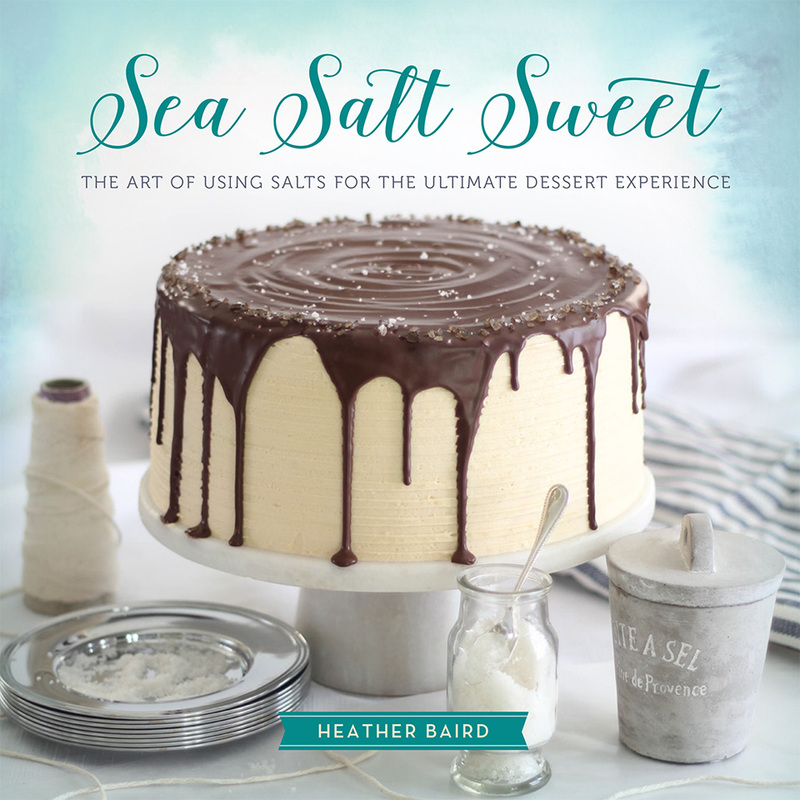 It's been a long time coming - a whole year in the making - and I couldn't be more excited to announce that Sea Salt Sweet is now available for pre-order! 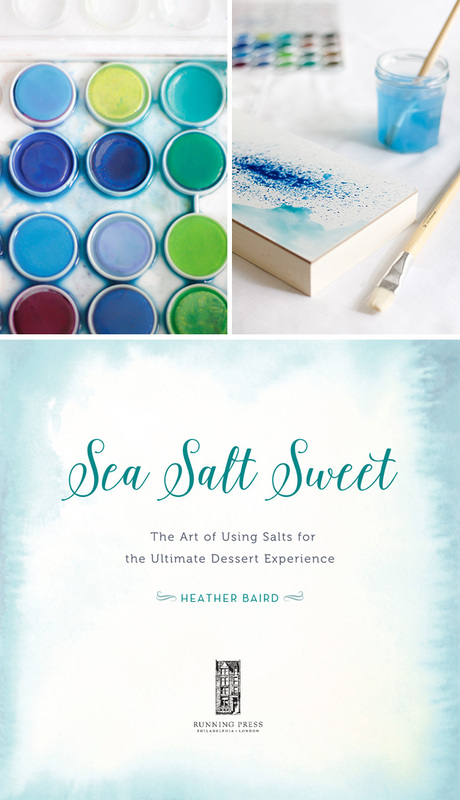 Over the past couple of years I've learned that there's an art to using salt in baking and confectionery. Sea Salt Sweet will show you how to add salt to your sweets in order to achieve the most mouth-watering, crave-worthy results! Better yet - it will demonstrate the best kinds of salt to use in a particular recipe. 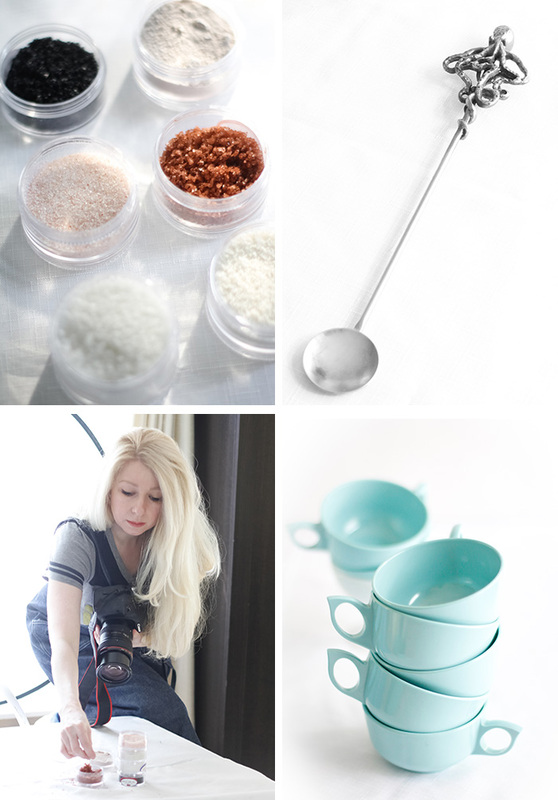 It's a primer to all kinds of colors and textures of sea salt, from powdery velvet sel gris, to the beautiful coarse topaz crystals of Alderwood smoked salt. The first chapter, called "A Pinch" uses salt in a subtle way, usually as a flavor-enhancer and leavener in batter and dough. As chapters progress salt is utilized differently -sometimes it's front-and-center on top of buttery toffee, and other times it's hidden in umami-rich ingredients like red wine and sharp cheddar. I don't have any recipes to share from the book yet, but you can be sure to find a couple of sneak-peek blog posts in the coming months. However, I thought it might be fun to show you some of the props I curated for the book. The past year I've been living in a sea of blue-green dishes, table linens and other serveware that a mermaid might keep in her cupboard. The mood and style of this book was important to me from the get-go, and so I endeavored to find the most beautiful objects possible. 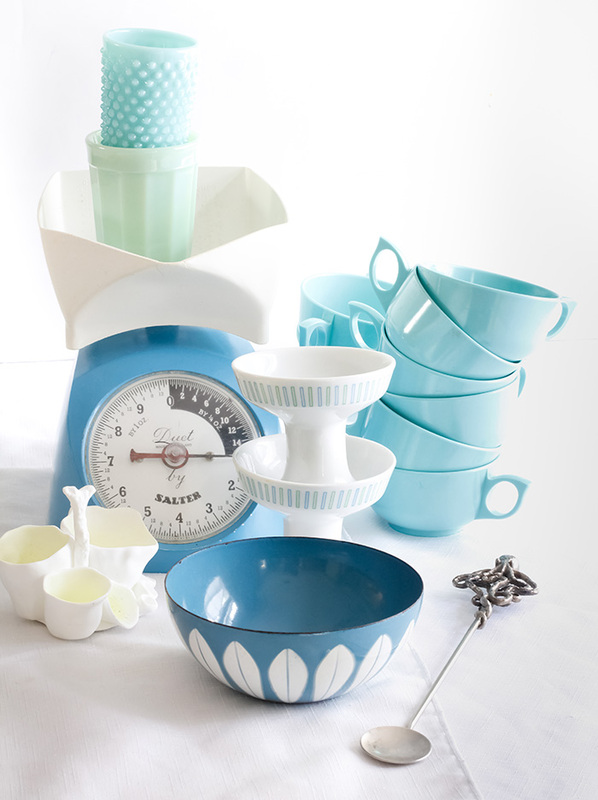 I scoured antique and vintage stores to find my favorite mid-century dish-makers such as furniture designer and onetime dish designer Paul McCobb and Scandinavian designers such as Cathrineholm and Nymølle ceramics of Denmark. quite the journey from Dublin, Ireland to my little hometown in Tennessee. Gosh. It's difficult to express how completely I've put my heart into this book. Aside from developing the recipes, baking, shooting and styling them (and writing about them, too) I also contributed some original watercolors to the design of the book. To say I'm hugely proud of this work would be an understatement. I just can't wait for you to read it! The release date is set for November (just in time for Christmas!) but you can pre-order in now at a reduced price from Amazon and Barnes and Noble. You can also find it at Books-a-Million, IndieBound, and Powell's. Gorgeous! Love that cake on the cover, can't wait to read it! Mmm sea salt. I too am loving that cake on the cover. Beautiful! It sounds very interesting. Wow CONGRATULATIONS! 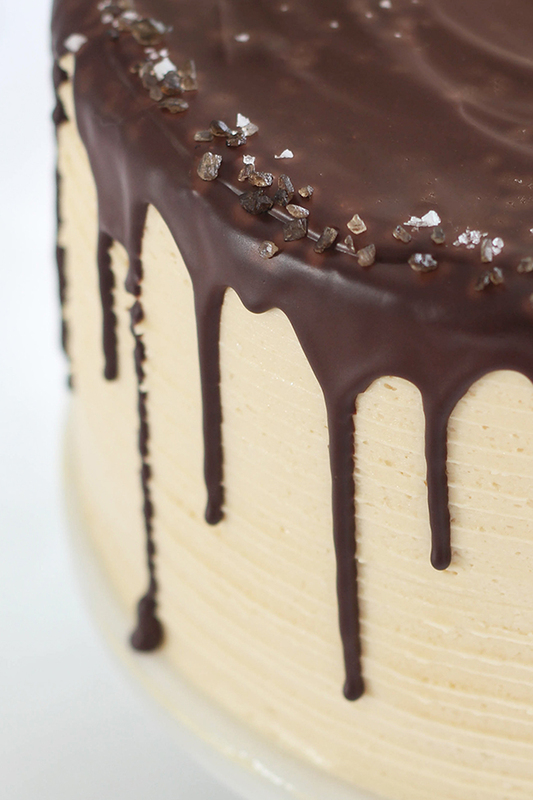 It look positively dreamy, swoon-worthy and delicious! Can't wait to see it! Congrats!! You're a pro and you deserve a BIG success with this new book. Ordered! And now I'm rejoicing. And drooling. Is it odd that I totally want that cover framed in a poster-sized print to hang on my wall? Another beautiful book with an engaging concept. I can't wait to get my hands on a copy! Congrats! This book will be on my birthday wish list. Loved your first book. Can't wait for this one to come out. Oh I can't wait to get this! I loved your first book, and I'm sure this one will be just as beautiful. Congratulations! I have your first cookbook, and love it. I visit your blog often and really enjoy seeing your beautiful baked goods! Congratulations! Great job on your new coobook, I've read your first one and love it like everyone else here. Can't wait to get this one! Congratulations on the new book! The cover looks so stunning! The cake is amazingly beautiful. You really did a great job with using salt in the art of baking. It is so mouthwatering and very irresistible! What a gorgeous creation! Are you going to be doing some kind of book signing? I've been dying to meet you, since I also live in Tennessee! I can't wait to get my hands on this book!